Twitter Wednesday launched applications that will deliver premium livestreaming video to Apple TV, Amazon Fire TV and Xbox One devices. Twitter accounts are not necessary to view the content—delivered in HD–and neither are subscriptions to cable or satellite TV services. Premium content available via the apps will include 10 livestreamed Thursday Night Football games from the National Football League, starting with the New York Jets at the Buffalo Bills this Thursday. Other fare will come from Major League Baseball Advanced Media, the National Basketball Association, Pac 12 Networks, Campus Insiders, Cheddar and Bloomberg News, as well as top tweets and videos from Vine and Periscope. 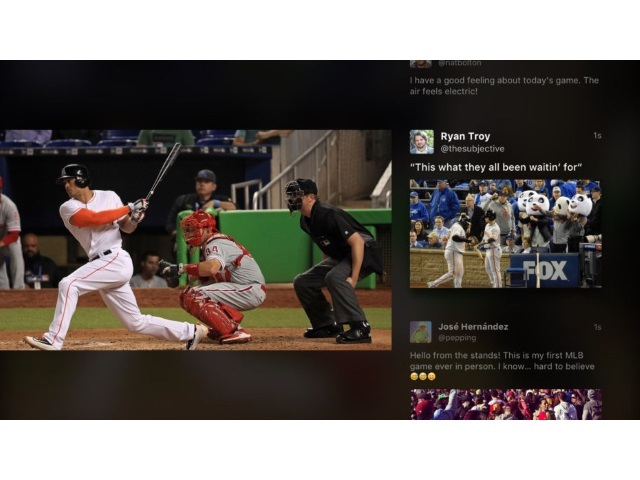 Twitter said the Apple TV version of the app (pictured) will allow users to view premium video content and tweeted video clips side-by-side. Apple TV: available globally via the App Store for fourth-generation devices. Xbox One: Available in Australia, Brazil, Canada, Mexico, the U.K. and the U.S.
Amazon Fire TV and Fire TV Stick: Available in the U.K. and U.S. These devices will bring Twitter’s live streaming video experience to life on the TV screen. Twitter has always been a great complement to TV, and now fans can enjoy even more premium video with live tweets and the best content on Twitter right from their TVs. We’re excited to introduce this new experience to people without requiring a paywall or having to log in to Twitter. Readers: What are your thoughts on Twitter’s new apps for Apple TV, Amazon Fire TV and Xbox One?